Joseph Rudyard Kipling (1865-1936) was an English journalist, short-story writer, poet, and novelist. 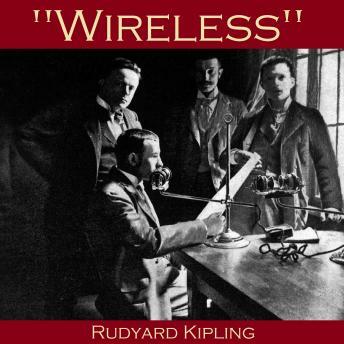 'Wireless' is a multilayered story set in a chemist's shop, where the nephew of the business' owner occupies a back room where he is experimenting with Marconi's new radio technology. The chemist's assistant, lovesick and also sick with tuberculosis, is staying in the shop overnight. The narrator is visiting, officially to observe the radio experiments...but he discovers that another set of signals are being received in the chemist's shop that night. The consumptive assistant, having had a tot of an alcoholic tonic, appears to be receiving extraordinary inspiration for poetry and is writing rhymes by Keats. The radio too is receiving some peculiar crossed signals. What can it all mean?